Our parrots love to be outdoors in the summertime!! CBH always recommends that bird lovers take all the precautions when exposing their parrots to the freedom of being outdoors (i.e. using a proper harness, securing cage doors correctly), but we understand that accidents happen. 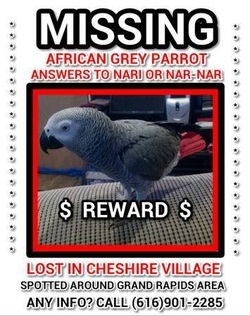 Through our Facebook and this page, we hope to bring lost parrots and their people back together! If you have lost a feathered loved one or if you have found a parrot, please use the link below to send us an email. Please provide as much information as possible. We will work with you create the listing and ensure that the bird's safety is the first priority. This little, one-year-old guy, named Banksy was lost in Kaleva (Manistee county) on July 9th. He was last seen near Bergstrom Dr and Kaleva St.
His owners can be contacted at 231-499-5214 or 484-894-4090. There is a $250 reward for Banksy's safe return. Nari was lost earlier this year and her loving owner's have been searching ever since. She has been spotted a number of times in the Grand Rapids area and with the warm weather, she may still be living outdoors on her own. Her owner's are offering a "triple digit" cash reward for her return. 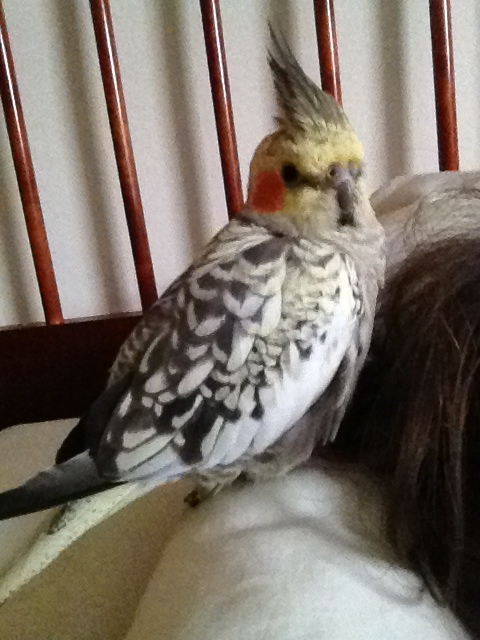 Nari is a very vocal parrot with a large vocabulary. She also says the names Cleo, Susie, and Nari. She makes a lot of unusual noises as well as meowing and barking. If you live in the area, please keep your eyes and your ears open! This bird is desperately missed and she is not equipped to live in the wild! She needs humans to provide food and shelter for her. If you have any information, if you've seen her and would like to know how to approach her, please email CBH or call her owner at the number provided on the poster.